The diary is a compilation of Haehle’s frequently asked questions from his radio show, column and personal appearances set in an easy to follow format. Month by month you will find answers to the most frequently asked questions…solving problems at the time they occur…along with instructions on what to do in your garden that month. There will be a page or two for your personal notes, a place to record your plant list and sprinklings of inspiration and encouragement from other garden philosophers. 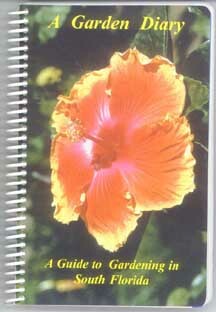 Now, when January comes, you will recognize the aphids hugging your hibiscus and begin to take action. Anticipate, Blossom, Create will be your garden credo as you travel down the garden path with Bob Haehle and M.E. DePalma. They will lead you to new adventures. Added Features:· Pages for Gardening Notes · Places to Visit · Internet Connections · Butterfly Gardening · Organic Pest Control - And So Much More! 201 pages with full color dividers, size: 5" x 8" with solid ring binding Published December 1999 Retail sales price $12.95. ISBN: 0-9676022-0-3 Available at your local bookstore or order online through Amazon.com. We continue to make updates to existing chapters as new information becomes available. Those of you who have purchased the book will find the updates online in dark green so you can add notes to your copy. All rights reserved. Reproduction or translation of any part of this work beyond that permitted by Section 107 of the United States Copyright Act of 1976 without the permission of the copyright owner is unlawful. [Section 107 allows use of the copyrighted work for the purposes of teaching (including multiple copies for classroom use), scholarship, research, criticism, comment, or news reporting.] Written requests for permission should be addressed to DePalma Enterprises, Inc., 2117 NE 17th Terrace, Wilton Manors, FL. 33305 Web architecture, maintenance and marketing by DePalma - Enterprises, Inc. Please contact our Web Manager with questions and comments.